Installing the standard Ubuntu 16.04 ISO on an Intel Compute stick with an Atom CPU results in lack of HDMI audio and wifi. I've combined some recent patches and source code and ported them with Canonical's kernel source to create an ISO that can now fully support HDMI audio, wifi and bluetooth. Prior to installing the ISO first check the BIOS settings by powering-on your Intel Compute Stick and pressing the 'F2' option. On the 'Configuration' page select the 'Select Operating System' as 'Ubuntu 14.04 LTS 64-bit' or 'Windows 64-bit' depending on the device model. This will make subsequent boots use the 64-bit bootloader meaning you will have to reset the option if you wish to later boot Windows. Now download the ISO from and write it to a USB using either 'Rufus' in Windows or 'dd' in Linux. The USB can then be used to boot from by pressing the 'F10' option immediately after powering-on your device. The initial menu screen takes slightly longer to appear than with the official ISO. Depending on the speed of your USB it can be anything from 15 to 45 seconds before anything appears on the screen. Only Atom based Intel Compute sticks are supported and include the STCK1A8LFC, STCK1A32WFC, STK1AW32SC and STK1A32SC models. Also note that the ISO includes a patched kernel to provide the missing functionality meaning it will not get any automatic kernel updates from Canonical. However other application packages will update as standard. Acknowledgements: Pierre-Louis Bossart (HDMI audio), Bastien Nocera (wifi) & Larry Finger (bt). 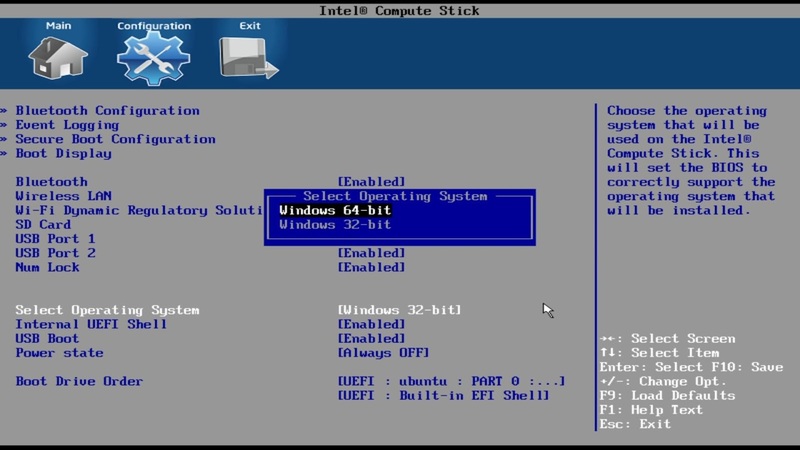 Installed on Intel Compute Stick Windows 32GB. Great job! How can I download iso? Links are not working for me and in some other cases, I don't have access. I have requested the access without any reply. Please help. Thank you. Would you share you patch or push it to kernel upstream? I don't know the official stand of Intel whether support Linux or not for Cherry trail SOC. is there a way to diagnose that ? I'm not sure what you mean with "the BIOS's 32-bit bootloader"
In the BIOS options, what setting do you have for 'Select Operating System? I have intel stick meegopad t05, i want install only ubuntu. click install ubuntu and only black screen, but signal hdmi fucntion. On BIOS dont have option "Select Operating System". This stick possible install ubuntu/linux?? The 'meegopad t05' is not supported. Thanks for your efforts, I'm planning to install it in my netbook voyo vbook v1 which uses Intel atom x5 z8300. Could you please write the md5 hash for the file, I tried to open it but I got invalid file error. Also if you know how to tell if the netbook uses uefi 32 or 64? Last thing, I managed to install the official Ubuntu 16.04 but it booted with portrait screen and I couldn't change it to landscape! Is your modified Ubuntu fix this issue? The 'voyo vbook v1' is not supported. It not working on Wintel Cx-w8. Black screen and freeze. Old method was better - try Ubuntu and run patches. It was working. It was better. It didn't work as the 'Wintel Cx-w8' isn't supported. But your Ubuntu 14.04 with patches was well working. Only built-in audio not work. Yes, but this time I do things differently. I installed the current version, 2016 october 13th, on my Wintel CX-W8 and everything works except bluetooth (hardware goes undetected?) and analog audio (same thing). BUT BOTH wireless and sound through HDMI do work. Will this work on Pipo X7? I don't support the 'Pipo X7'. My Laptop is iBall Compbook Excelance with Atom z3735f, 32 emmc, 2gb ram and Windows10 preinstalled. I have intel compute stick stck1a32wfc. I've tried installing your 16.04 build and then previous 14.04 builds and i keep getting errors. This last time I've tried i got an i/o error. Some of the other times I was able to install but after reboot it says boot device not found. I've tried with uefi enabled and disabled. My bios is set to 64-bit ubuntu. Any help would be appreciated. Bare with me as I get familiar with the stick and ubuntu itself. I've installed on pc's before but this is being a pain. Thanks for your help! Good to hear you have it all sorted out now. I have the same error how did you fix it if you care to share. I am using asus x205ta pc it has intel atom z3735f processor, can i use this ISO for a complete fully functional ubuntu? This ISO is specifically for Atom based Intel Compute Sticks. I've not worked with the vbook so I can't help unfortunately. I've been tinkering with this on the first gen stick, and it works well, but the audio can be a little strange. It works just after install but then quickly stops working. I suppose it could be my TV. FYI so far there haven't been other reports of sound stopping that I'm aware of. Hi! Thanks for this. Great job! But there is one thing. What about kernel updates? I think it's important. I'm looking into this as I want them as well. Will this work on Meego Pad T04? Thanks for the work testing and incorporating patches on ubuntu 16.04 + writing instructions. I bought a stck1a32wfc ICS originally with W10.1. I ran it once with W10.1 and it froze. I just assumed this was Windows and proceeded to install your patched ubuntu 16.04 (AMD64). Although it runs well, it freezes after half to one hour....requiring a hard shutdown. I've noticed many forum entries with the ICS freezing with Windows now, so I assume it is a hardware/firmware issue. Intel suggest to install latest firmware, unfortunately, I already have that, so before I return the thing, is there any test/check I can do to assist others using this ICS with Ubuntu 16.04? Limiting the c-state to 1 sloved it for me. Cool, thanks Dennis - all done - hopefully won't need to return it. Will let you guys know how it goes. The cause of the freezes are not fully understood. My kernel is patched but it still seems to freeze for some. Using the kernel parameter to limit the system to only C-State 1 can only be considered as a workaround for those willing to run the device continuously. Thanks - it certainly works as a workaround on mine - at least so far. Installed on STK1A32SC and ubuntu works fine other than whenever you insert an SD card dmesg reports "mmc1: error -110 whilst initialising SD card". I tried various brands and card sizes. I thought sd card reader was defect so returned and got a replacement which did the same thing. I installed Windows 10 64-bit and the card reader slot works fine so clearly something specific to Ubuntu 16.0. Anyone else see this and have a solution? I don't have a solution at the moment. It is not an ISO problem as SD cards doesn't work with Canonical's Ubuntu 16.04 ISO either. I am also suffering from this issue. I've tried a few different kernels but no joy. Has anyone had any luck with SD cards yet? I installed the patched version and although I see WiFi and Bluetooth interfaces, I can't connect to WiFi (asks for password, I type it and can't connect) and can't connect rapoo Bluetooth keyboard - starts to connect and fails. Any suggestions? Help please.. Im newbie in Linux. This device is it compatible? Actually I made it boot live on this PCStick. Just need a 32-bit EFI bootloader (pcbox decided that's not going to change). And all went as expected. Tested with a 32-bit version though, should test a 64-bit one with 32-bit EFI loader (if it works at all). Hope this helps bringing more devices to this awesome OS. first of all, great job providing this image. 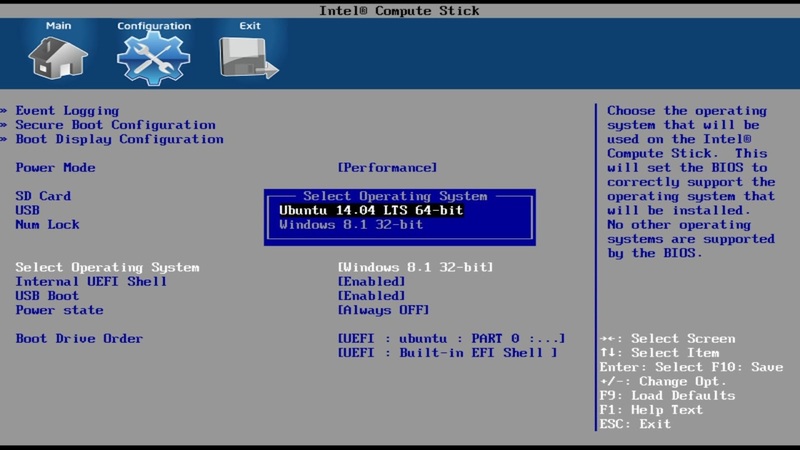 I've installed the latest version (Linux intelstick 4.4.0-21-linuxium #37+ics SMP Mon Apr 25 19:39:09 AEST 2016 x86_64 x86_64 x86_64 GNU/Linux) on a STK1A32SC and HDMI audio pass-through works fine so far. But currently I'm having troubles watching Amazon Prime HD Videos on Google Chrome. Amazon tells me that the computer does not apply the HDCP regulations..
Is this a Intel HD Graphics hardware driver issue or should HDCP normally work on linux with a x5-Z8300? Btw I'm using Chrome since it's the only supported browser and silverlight via pipelight won't work either. I'm not familiar with HDCP however Googling 'linux HDCP regulations' shows that you are not alone. could this be ported to an Intel atom tablet? Probably, but as I don't have an Intel Atom tablet I haven't tried. I've got my intel ubuntu stick connected to my old motorola atrix lapdock. 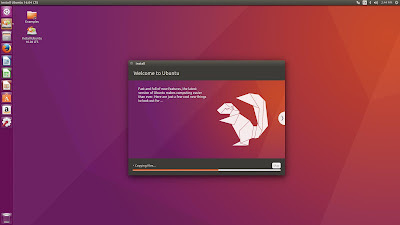 It works very well but because of lack of memory errors I can not do any updating of ubuntu. What is the best solution to this problem? I've removed several applications but that does not free up enough to update.Any help is appreciated. I'd probably use a separate partition for /home making the new mount point on the micro SD card and so freeing up additional storage for the Ubuntu OS. There are plenty of guides on the web explaining how to do this. Another benefit is it will allow you to re-install Ubuntu without loosing your data. Any chance it could work on Jumper Ezbook 2? My ISOs only work on Intel Compute Sticks which are the actual products from Intel and not a generic collective term for Intel based mini PC sticks. You would have to port to the Jumper Ezbook 2 yourself. I have Linuxium Lubuntu 16.04 installed on a STCK1A32WFC and got the previously mentioned freezes. However when I switched to to 5V 2A USB charger the freezes stopped. co-incidence???? I want to thank you a ton, now I can boot and experiment with Linux (Ubuntu) any time I want on my Lenovo 100S-11iby. It boots fine, even audio and wifi work from the start. I am just about to create a backup of my internal storage. Only thing I noticed now, was a freeze, when I was playing a youtube video, just when I wanted to start the dd backup. But other than that, it really runs great! Thanks a ton for the work! Once we get the random freezes fixed, this will be a solid OS for my system. Until then I can just boot it from the stick and play around with it. Will quickly try, if I can boot off of an external SD card. If that works, this is the perfect dual boot for me, since I can just boot of an external device, if I need linux. i need a iso for another atom device, my device is a yepo 737 s cherry trail, the post mirror is not work. Try an ISO from my latest posts. These ISOs have been superseded. I recommend you try my isorespin script to create an equivalent ISO. See http://linuxiumcomau.blogspot.com.au/2017/04/creating-personalized-ubuntu-mint-and.html for details. You need to read http://linuxiumcomau.blogspot.com.au/2017/06/customizing-ubuntu-isos-documentation.html. The whole point of my script is to give you the flexibility of creating an ISO that meets your requirements and not have to download a pre-configured one that doesn't. The original ISOs should not be used in light of the Meltdown/Spectre vulnerabilities and Intel SPI driver ('Lenovo') BIOS issues. 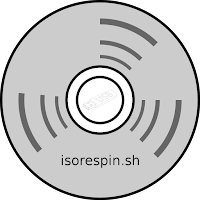 Instead you should use either official ISOs or respin an official ISO using my 'isorespin.sh' script. I've posted comprehensive documentation on how to use the script (see 'http://linuxiumcomau.blogspot.com.au/2017/06/customizing-ubuntu-isos-documentation.html') and you can also post issues (see 'Reporting issues' in the documentation) and I'll try and help where possible. When I first built the Intel Compute Stick (ICS) ISOs I took mainline source and patched it to create a customized kernel. Then because customized kernels were not officially supported I had to rebuild and reissue the kernels when new official kernels were released. Now that the current mainline kernel has included most of the functionality I provided through my customized kernels the interim need for my customized kernels has been removed. However for an ISO to work on an ICS it needs a later mainline kernel than the one supplied by the official ISO plus some userspace files. But the overhead to continually spin and upload all the Ubuntu flavours in the latest and LTS releases was huge. And given that weekly RCs come out that workload was excessive. Ubuntu plus six flavours times two releases was fourteen ISOs with each one taking two to three hours to upload (upload speed in Australia isn't) meant a worst case scenario of 42 hours of weekly uploads. And then some people wanted Linux Mint and Neon and Elementary and a whole lot more. When something is free nobody has problems in making demands! So I built my 'isorespin.sh' script to give everyone the flexibility to create an ISO with what they want and when they want and to make sure it was easy to use I wrote documentation which included examples. Back to your question: why did you take down the pre built ubuntu iso? Because I no longer maintained it and maintenance is required to ensure security. And if using my 'isorespin.sh' script is a bit complicated then use one of my interim ISO builds (e.g. http://linuxiumcomau.blogspot.com.au/2017/06/interim-ubuntu-1704-iso-with-mainline_20.html). Linuxium do you think you can make a tutorial on how to get windows installed on the Ubuntu version of the ICS? The Ubuntu version of the ICS doesn't meet minimum specs required for Windows and from experience 1GB RAM would be insufficient to run Windows. Basically you should use the installed version of Ubuntu or alternatively use Lubuntu or a similar Linux distro for lowly spec'cd devices. It is work my Intel Compute Stick STCK1A32WFC. Your scripts don't work and you won't let us download the ISOs. Complete waste of time, thanks for nothing. I've have posted some example ISOs which can be downloaded given I don't have the bandwidth to host every ISO with every respin option. Also see 'Reporting issues' under 'http://linuxiumcomau.blogspot.com/2017/06/customizing-ubuntu-isos-documentation.html' if something doesn't work. The example ISOs should not be used in light of the Meltdown/Spectre vulnerabilities and Intel SPI driver ('Lenovo') BIOS issues. Could I add Ubuntu on it? AND/OR could I use this ISO on it? The reason why you see 'yes and no' is because so many things depend on the device and BIOS as well as the SOC (processor). Which actual device are you getting? i havea an intel compute stick model STCK 1A32WFCR that is stuck on the (shell is missing screen)thats when i start up the stick and then its shows the logo of intel and then the error comes in. i cant access the the windows 8.1 intalled in it. Use my 'isorespin.sh' script to respin an official Ubuntu ISO to make an ISO suitable for booting and installing on your STCK1A32WFC device. See the documentation link (top right above) for detailed instructions on how to use my script. I've tried to create a respun bootable USB (with Atom options and newest kernel) using dd twice, but the Ubuntu option does not show in my Compute Stick BIOS. Any idea what I'm doing wrong? What is the 'OS Selection' set to in the BIOS and what options did you use to respin your ISO and finally what was the ISO you respun?